New Directions Publishing Corporation, 9780811215466, 232pp. From Italy, an epistolary novel like no other, full of Tabucchi's special "enchantment, which trans-figures even as it captivates" (TLS). 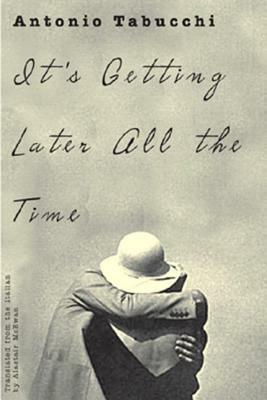 In It's Getting Later All the Time, an epistolary novel with a twist, Antonio Tabucchi"internationally acclaimed as the most original voice in the new generation of Italian writers" (The Harvard Book Review)revitalizes an illustrious tradition, only to break all its rules. Seventeen men write seventeen strangely beautiful letterstender or rancorouslonely monologues which move in circles, each describing an affair, and each desperate for a reply which may never come. The letters plunge the reader into an electric, timeless no-man's-land of "this past that is always somewhere, hanging in shreds." And at last, collecting all their one-sided, remorseful adventures into a single polyphonic novel, an 18th letter startlingly answers the men's pleas: a woman's voice, distant, implacable, yet full of sympathy. It's Getting Later All the Time captures destinies which, though so varied in appearance, are at rock bottom all the same: broken. This is an anti-Proustian noveltime lost is lost forever: it is impossible to get back to the past no matter how it haunts the present. As Tabucchi remarked, "Broken time is a dimension you find lots of men living in...an ambiguous, impossible situation, because they are faced with a kind of remorse, a choice they never made.